If Stearns Bank SBA lender Katie Bobb is ever in Staten Island, New York, she has a free dinner waiting for her. 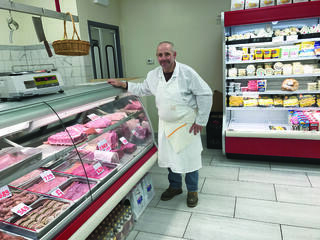 That’s how pleased Sal Civiletti was after working with Katie and Stearns Bank on an SBA loan to help start his dream business, Sal’s Prime Meats, in Staten Island. After not finding the right financing for his start-up business early on, Sal was eventually referred to Stearns Bank. He found the experience of working with Stearns Bank to be a refreshing one. The fact that Katie and Lucia were so personable made things more comfortable for him. Sal’s Prime Meats has fresh meat and poultry available every day, along with a dairy case to choose from. They have a deli selection available and can cater parties as well. The whole goal for Sal was to have as wide of a selection as possible for his customers. Sal’s officially opened in May 2017.